Books never die, but they can be forbidden. Medeisia is a country in turmoil ruled by a blood thirsty king who has outlawed the use of magic and anything pertaining to knowledge. Magery and scribery are forbidden. All who practice are marked with a tattoo branded onto their wrists, their futures precarious. Sixteen year-old Drastona Consta-Mayria lives secluded, spending her spare time in the Archives of her father’s manor surrounded by scribes. She wants nothing more than to become one of them, but when the scribes are royally disbanded, she is thrust into a harsh world where the marked must survive or die. The smell. Wet ink, old parchment, and leather. The smell consumed me, weaving its way through my nostrils and down to my eternally ink-stained fingertips. It was an old, comforting smell. The smell of new beginnings, of adventure, and of disappointment. “I’m sorry, Stone. The mistress has forbidden it.” Master Aedan avoided my gaze as he moved through the Archives, stacking scrolls that were already perfectly aligned. His long, grey beard skirted the floor as he paced to the shelves before running a wrinkled finger along the books within. His brown, heavy cloak hung around his bony wrist. He seemed older each time I saw him. I focused on the shelves. The shelves were nothing more than deep grooves built throughout a circular stone room, and they held centuries of records, stories, and legends. Ladders leaned sporadically against the ledges, and candles burned inside protective glass casings. Fire would not be risked within the Archives. “Did she give a reason why?” I was whispering, but speaking louder was out of the question. The space felt too sacred. I mumbled promises to Escreet, the Goddess of Scribes. They were promises to serve if only Aedan were wrong. Tears felt imminent. The mistress, my stepmother, was stealing my essence. The Archives, the histories housed within the cavern, were my life. I had been raised on the smell, on the rough feel of parchment, on the historic words scrawled within. Master Aedan’s gaze finally met mine, his kind, bushy brows lowered over shadowed eyes. “Tis no place for a lady.” It was all he said. The words were not his. “I’m no lady,” I muttered. Ladies wore dresses that weren’t covered in dust. Ladies didn’t have stained, calloused hands with nails bitten to the quick. Ladies didn’t write, ladies didn’t study, and they certainly didn’t think for themselves. Master Aedan sighed, his hands gripping a roll of parchment before moving toward me. “She has forbidden it, Stone,” he repeated, his gaze moving from the parchment to my hands. “But she never said parchment outside the Archives was off limits. Take this. She is a witch, my dear, there is no doubt, but what she does now protects you.” I looked at Aedan. Protects me? By closing me off from the Archives? “Go now, child. Go,” Aedan murmured as he shooed me from the room. I held the empty paper to my chest protectively, the scent tickling my nose as I ducked out into the manor’s hall. A tear worked its way down my cheek, digging a channel through dust-covered flesh. The Archives rarely needed regular cleaning. No one, with the exception of the scribes, ever saw the interior. “She can’t do this.” My words were confident, my demeanor wasn’t. Even as the heavy, wooden door closed in my face, I knew I was wrong. She could do this, and she had. I turned on my heels, the back of my hand swiping my cheeks as I ran for the stairs at the end of the corridor. The hallway was a small one, the stone stairs jagged and uneven as they led up from the caverns beneath to the main manor above. Forticry. Forticry, Medeisian for strength, was aptly named. The manor was an intimidating, dull buttress that sat on the edge of Medeisia, a mountainous country covered mostly in forests. It was made entirely of stone. Although small, as far as manors go, it was an important gateway into our country and was situated against deep woodland and mountains. Beyond the forest’s edge, a desert stretched; a barren wasteland between Medeisia and its twin country, Sadeemia. The manor was in a strategic location. The stone stronghold had a view of the forest and mountains in one direction, and the desert border in the other. Because of this, Forticry was the home of the Medeisian Ambassador, Garod Consta-Mayria, a man who played an important role in the politics between Medeisia and Sadeemia. He was also my father. The stairs were a blur beneath my feet. The tapestries lining the grey stone walls were a blended, bright mess as I ran through the main entry, a hall made up of one massive hearth and a line of family portraits. I didn’t spare them a glance as I slipped the parchment Aedan had given me down into my dress. My gaze was on an arched entryway leading into a room covered in tapestries of flowers and greenery. There were two stuffed settees, the fabric made out of dark green velvet with gold tasseled pillows. Between them sat a large potted plant, a fern with wide, hanging leaves. Lying across one of the expensive divans, her dark curls spread across a pillow, her small, beaded slippers teasing the foliage at her feet, was my stepmother, Lady Taran. I stopped just inside the door, my eyes trailing Taran’s low cut, sapphire blue gown. The silk shone in the late afternoon light from a nearby arrow slit window, her tanned skin glistening where the too tight dress pushed up her bosom. One move, and she’d be half-naked. “Why?” The question was loud in the still room, my voice wavering as Taran removed the arm she had slung over her eyes. She was a beautiful woman, my stepmother, and she knew it. “The Archives is no place for a lady, Drastona.” Her voice was firm, stern. I took a hesitant step forward. “You never cared before.” Taran sighed as she pushed herself up, her green eyes darkening as her gaze found mine. “You were not sixteen before.” I placed my hands against the tapestry at my back, the stone wall behind it lending a comforting support. “I do not understand.” Taran laughed. “Of course you wouldn’t, dear. Your father has never forced you to learn the etiquette required by most ladies. He has spoiled you. While you’ve been hiding amongst dusty shelves and flea bitten scribes, our world has changed.” “Changed,” I repeated. I was only mimicking her now. I knew the politics. I was an ambassador’s daughter, and I was fond of the Archives. Medeisia’s king, Raemon Berhest, had become a dictatorial recluse over the past five years. His laws were harsh, his edicts verging on murder. Even his inner circle wasn’t immune to his iron hand. This included the ambassador and his family. “We’ve been summoned to court,” Taran announced, her green eyes sparkling as she fanned herself. Her cheeks were flushed with excitement. I wasn’t enthused. “It’s a dangerous place,” I said, my eyes wide. Taran ignored me. “The king is yet unmarried, and the court will be overflowing with eligible titles. There will be opportunity in this.” It didn’t take long for her words to sink in. “No,” I gasped. Taran grinned. “Mareth will undoubtedly ensnare the better match, but your marriage could be advantageous to us as well.” Her words sounded distant. They were echoes between a rapid beating heart. “But I’m to be a scribe.” Mareth I could well understand. My half sister was born to be a Lady. She reveled in her station. I had never wanted a title. I was, after all, the proclaimed illegitimate daughter of Garod. His name offered me protection, nothing more. My father had encouraged my interest in the Archives. I had always believed he would let me stay there, away from the prying eyes of the public. But now . . . “You may have been born on the wrong side of the cloth, dear, but your duties to your father remains. You will marry.” I couldn’t breathe. My chest felt too tight, my knees felt weak. The tapestry behind me was now bunched in my fist. I clung to it. “Your fondness for knowledge is all well and good, Drastona, but it can only harm us now.” Taran pulled a cord hanging from the vaulted ceiling near her head. I didn’t even hear the sound the bells made as they traveled throughout the manor. I was deaf to it all. It wasn’t until Aigneis’ strong hand settled on my shoulder that I moved. Her dark eyes met mine, the depths full of sympathy and something more. Fear maybe. “You knew?” I whispered. Aigneis was a middle-aged woman with dark auburn hair braided and wrapped around the top of her head. It was peppered with grey. She had been my nurse for as long as I could remember, and she knew as well as I why going to court would be dangerous for me. I didn’t wear the mark of the mage, but the power ran through my veins. Taran was not aware of it, but my father was. King Raemon had outlawed magic four years ago. Anyone with tainted blood was to be marked, a tattoo of a star on fire branded onto their wrist. It was a death sentence. “We can work around it,” Aigneis answered, her breath against my ear as she guided me out of the parlor to a twisted stone staircase beyond. Her burning star flashed from her wrist as she took my hand in hers. I let her grip comfort me as she pulled me up the stairs and into my room, shutting the door against the chaos below. The Archives. Court. Marriage. Something was wrong. It was all too quick. Aigneis was agitated. It was obvious in the way she moved spastically around my room, her reddened hands patting her hair every time she walked from the hand-me-down tall, Henderonian armoire to the scarred open trunk at the end of my bed. My gaze followed her until the constant movement caused a dull ache behind my eyes. “You’re worried,” I finally stated. Aigneis paused in mid-stride, a rose-colored garment folded over her arm. Her eyes wouldn’t meet mine, and the room’s low light threw shadows across her face. “A little,” she admitted. I stood up and moved to the armoire, my eyes tracing the complex, circular designs in the oak the Henderonians were so famous for. The wardrobe was an imported piece that had once belonged to Mareth. When one of my half sister’s famous fits rendered a long crack down the middle of the door on the right side, the piece had been retired to my room and another wardrobe was commissioned. I was glad of Mareth’s temper. I loved the piece, crack and all. Its thick wooden legs had the wardrobe sitting a few inches off of the floor. For years, I had practiced writing on its underside, the upper half of my body hidden under the massive armoire. By the time I was thirteen, baby fat made it impossible for me to slide underneath, but I knew the markings were there and that was enough for me. “You cannot go,” I said. Aigneis sighed and closed the trunk before patting the top. I accepted her invitation and moved to take a seat. She lowered herself next to me, kissing the top of my head as her right hand stroked my loose hair. I never wore it up. The dark, sun streaked strands were too unruly to tame. “Ah, my heart, it is not our decision to make.” She was wrong. Court may be dangerous for me, but it was a death sentence for her. My eyes met hers, and she noted the concern there. Her free hand came down to cover my clenched fists, folded demurely but angrily in my lap. “I am marked, yes. But I work for a noble family. My position protects me.” I shook my head, and her hand fell away from my hair. “Here. It protects you here. Not at court. Not where your mark will taunt the king himself.“ My words were sharp, but Aigneis was like a mother to me. She had served my birth mother before myself, although I was pretty certain my mother had been of low birth. Aigneis never spoke of my mother, never described her, never revealed much outside of her love for me. Even Taran’s curious questioning had been ignored despite several lashings my stepmother had inflicted on Aigneis. My father was ignorant of Taran’s curiosity, but I had seen Aigneis’ scars. I had helped apply the ointment when Taran’s whippings went too far. I had threatened to go to my father once, but Aigneis had forbidden it. Her mark made her vulnerable to accusations. “Your fear should be for yourself,” Aigneis whispered. I was sixteen, the year most mages acquire their power. My mother had been a mage. It was the only knowledge Aigneis had been willing to part with, and it had simply been to prepare me. A wise choice, considering I had started showing signs earlier than most. Nature, Aigneis said, was my forte. Animals, for example, were attracted to me. As if on cue, a low kek, kek filtered through the room, and I looked over my shoulder at a narrow casement with a makeshift windowseat fabricated from an old, broken trunk and large, well used brown pillows. A falcon perched on the stone sill, her sharp eyes glancing briefly at me before preening her bluish-black wings. She was a beautiful creature, almost three pounds with a nice forty-seven inch wingspan. She had black wingtips and a rusty, dark barred underbelly. I called her Ari. I had rescued her as an eyas from a falconer who insisted she was not suited for training. And, although I had released her to the wild years ago, she still returned to me often. Watching. Always watching. “I do not fear for myself,” I said quietly, standing so that Aigneis could continue to pack my trunk. Nothing in my room matched. The furniture was nothing more than old, worn settees covered in red or black velvet. Heavy tapestries with forest frescoes hung along the walls, and candelabras rested on bare wooden tables. In one corner stood a plain wooden chair against a low desk covered in parchment and ink. The other corner held my bed, a semi-large four-poster with an uncomfortable mattress stuffed with straw. The midnight blue comforter that covered it was thick, worn, and soft; I loved it as much as I loved my Henderonian armoire. “You have come at a bad time, dear Ari,” I crooned as I moved to the window seat, my hand coming to rest carefully against the falcon’s head. Ari ignored me, her eyes sweeping over Aigneis as she folded one last dress before closing the trunk for good. Aigneis’ cheeks were flushed, and I berated myself for not offering to pack the trunk. But what little rebellion I had left in me refused to pack for a trip I did not want to make. “The journey will not take long, a week at most. At court, alliances will be made quickly. If you are wed, it will be done in haste.” Aigneis’ words were low, rushed, and I looked up at her, my eyes wide. “Why are you telling me this?” Aigneis’ jaw tightened. “Because that is the way of things now, Stone. Court is not as it was. No one speaks truth. Alliances are the only thing that matter. Trust no one. People are pawns in the king’s game, and it comes at a bad time.” I was frozen, watching as Aigneis’ eyes skimmed the room cautiously. “Aigneis?” I asked, but my unspoken question was interrupted by a loud knock at the door. Aigneis moved to answer it, her hand lifting once more to her hair. She tended to smooth it when she was anxious. “Aigneis,” a man greeted, and I shooed the falcon hurriedly out the window as my father stepped into the chamber. Garod was a large man, of average height but solidly built. He was tan of skin, like most Medeisian men, and his chestnut brown hair was cropped short and left uncovered. He wore a casual, belted dark brown tunic over tan breeches with tall, shiny black boots. His deep green eyes met mine evenly. “Daughter, I expect you know of our invitation to court?” His gaze was sympathetic. It reminded me of another moment many years ago, the only other time he had ever entered my chamber. He had been appalled by the furnishings and had threatened to remove them all, replacing them with splendid, imported pieces. But I loved my room, and I refused. Garod was not a bad father, just a busy one. “May I request to stay behind?” It was a futile attempt. I knew it by the look in his eyes, but stubbornness knows no bounds. Garod moved awkwardly in the small space, folding his bulky form to sit firmly on the edge of my bed. It squealed in protest, and I worried about the frame. My father didn’t seem to notice. “These are bad times. No one is immune to Raemon’s edicts. Marriage to the right nobleman . . . it is the way to protection.” Marriage again. I fought the urge to bite my nails. “I could be a scribe. I know the work.” Garod’s face fell, his gaze moving from Aigneis to the door before returning to me. “Drastona,” he began, one large hand coming up to pat my shoulder awkwardly. It was a bad sign. “The scribes are being disbanded.” It took a moment for the words to sink in, but when they did, a strange numbness stole over me. “Disbanded?” My question sounded distant even to me. Aedan’s words played in my head. She is a witch, my dear, there is no doubt, but what she does now protects you. “Like the mages?” “Aye,” my father answered It was too much; first the mages and now the scribes. Magic, knowledge, and writing . . . all outlawed. I sat down heavily next to my father. “Why does he fear it all so much?” I whispered. Garod closed his eyes briefly, lifting his hand to rub a spot above his brows. “Knowledge is power, and King Raemon fears all power but his own.” My father’s words were treasonous, spoken in whispers inside of a worn out room with only myself and a weary maid. I glanced at my window, at the darkening horizon beyond. A few stars braved the semi-darkness, sparkling against a purple-hued sky shot through with pink. “And their mark?” I asked. Stray clouds lined in grey wove among the brave stars, vicious warriors attempting to snuff out hope. “An inkwell covered in cracks,” my father answered. I thought of the men and women I’d spent my childhood sitting next to in the Archives, of their good-natured hidden smiles as I wasted parchment with innocent doodles. “The Archives?” The words came out on a gasp, my throat constricted by tears. “It will remain,” my father answered. “But the scribes will be sent away.” The clouds outside had overtaken the stars, the thick, suffocating dark masses eating the brave celestial bodies alive. The scribes were being sent away. To die? “Be ready on the morrow, Daughter. We leave at dawn.” My father’s large hand landed gently on the crown of my head before suddenly disappearing. I never heard him leave. My eyes were on the window, on the occasional brave star as it tried to break through the cloud cover. Medeisia was fast becoming a land of ignorant people forced to follow a mad king. We were being snuffed out, eaten alive. We must overcome and prevail … King Raemon of Medeisia is slaughtering tattooed scribes and mages, forcing them into hiding. All marked and those associated with them are destroyed. The people are desperate. Months after challenging Raemon, the marked rebels of Medeisia must rise against their bloodthirsty king or chance being annihilated. Sixteen year-old Drastona Consta-Mayria is the prophesied phoenix of peace, desperate to be a leader for her people despite her reservations. Following the lead of a scarred and forgotten prince, Drastona will embark on a journey with an unlikely band of rebels and a dragon across a cursed desert to bring down a king and save a kingdom. Copyright © Regina K. Ryals, 2013 This is a work of fiction. Names, characters, places, and incidents are products of the author’s imagination or are used fictitiously and are not to be construed as real. Any resemblance to actual events, locales, organizations, or persons, living or dead, is entirely coincidental. Prologue Booted feet marched heavily down an ivory marble hall, the sound echoing along the walls in an eerie cadence that sang of determination. There was no fear in the walk, only purpose and confidence. The marble floor shone so brilliantly that the walking man’s reflection met each step in an odd mirrored manner, as if the floor was made of glass rather than marble. But if the floor was magnificent, it was nothing compared to the man. Large black boots covered strong calves before blending into a pair of tight, tawny breeches stretched over muscular thighs. The man was tall and large, his frame broad, his height over six foot. A plain, billowing white tunic covered his torso, the rippling muscles in his chest obvious where he left the shirt untied. A large black ink tattoo covered one side of his exposed chest, the design foreign and odd. But it was his face that captured the eye and held it. His face was like the marble he walked on, all hard planes. He was too rugged to be pretty, too wicked looking to be elegant. According to an upstairs maid, who often tended his room during bathing, he was simply sinfully dangerous, like the massive wild cats that prowled the humid forests of Yorbrook, a country most in Sadeemia had never seen but had often heard of. Mahogany-colored hair streaked with sun-kissed gold brushed the tunic’s collar in a careless manner, as if the man spent more time running his fingers through it than he did brushing it. His brilliant blue eyes were piercing, his gaze both intimidating and deadly, and he knew it. He knew it because he’d spent years shaping himself into the man he was now, a man of irony whose personality often contradicted itself. Sinfully dangerous. It was a good description, and the floor’s reflection made servants stationed along the wall shiver as he passed; their heads bowed, eyes on the face in the marble. The man’s stride took him down a wide receiving hall with high vaulted ceilings. Other than the marble floor, there was no decoration. Liveried soldiers and servants lined the unadorned stone walls. The ceiling above had been outfitted with a thick glass window, and sunlight poured down into the room, the glow highlighting a massive golden throne at the end of the hall. An equally formidable—yet older—man sat upon the velvet-padded throne, his calculating eyes on the man approaching him. His head lifted, and he spoke, his words booming. “How severe you look, son,” he said The man on the throne had the bearing of a king, and rightly so, for King Freemont Horan Bernhart VIII had ruled the country of Sadeemia now for over fifty years. The only outward sign of his increasing age was the white that now streaked his light brown hair and beard. The younger man paused a few feet away from the throne’s dais before going down on one knee on the marble. “Your Majesty.” He had a low, smooth voice that commanded attention. The king lifted one jeweled hand, waving it dismissively. “We won’t stand upon ceremony today. Rise, Cadeyrn. Deliver your news.” Prince Cadeyrn Forsen Bernhart, the second son of Freemont, stood. His movements were as fluid as his voice, and he raised his head, his piercing eyes meeting the king’s evenly. “There is something brewing in Medeisia, Father. I want to send a spy into the country.” The king stared over his son’s head, momentary silence reigning before he stood slowly, his eyes hard. “Out!” he bellowed, his hand gesturing at the silent servants and guards stationed along the hall. Cadyrn never flinched. Within moments, the hall was empty. Freemont’s gaze returned to Cadeyrn. “You are a foolish man, son.” Cadeyrn’s eyes glinted. “Am I? Says the king who has been turning a blind eye to his Western border for years.” Freemont stepped down from his throne, moving off the dais so that he stood on even ground before his son. The movement only emphasized Freemont’s aggravation, for at twenty-five turns, Cadeyrn had bypassed his father in height by several inches. It irritated the king to look up at anyone, particularly his son. “Says the man who has been telling me for years that Medeisia wishes our country ill will. Where are the soldiers, Cadeyrn? Where are the invading armies?” Freemont shot back. The prince stared down at his father. “I have been leading your army into war for eight years. Eight years! Eight years I have been sailing the seas, strengthening your foreign relations, commanding your armies in skirmishes history will never tell about, watching good men die under my command so that Sadeemia could prosper and Arien could remain home with his bride to produce your heir. Eight years. I know war, Father. I have built your kingdom with the blood of your men, with my blood.” “And this makes you an expert on my Western border?” the king asked. “No one would attempt to cross the Ardus, and Raemon doesn’t have the man power to come at us from the sea.” Cadeyrn shook his head. “We have nothing to base those presumptions on. There is only silence from Medeisia. Raemon has cut himself off from most trade. There hasn’t been a foreign emissary inside his borders in years. We have no idea how strong, or weak, he is.” Freemont was silent, his eyes searching his son’s gaze before he moved once more onto the dais, perching carelessly on the edge of his throne. “Something has happened to bring you to this sudden conclusion,” Freemont remarked. He knew his son better than Cadeyrn liked to admit. If Cadeyrn was approaching the king now, then he had good cause. Cadeyrn took a step toward the throne. “I had only one contact in Medeisia. Garod Consta-Mayria. He was the only man in Medeisia permitted any dealings with me or my men, and even he is not from Sadeemia. Do you not think it odd that Raemon allows no foreign representatives within his country?” Freemont’s eyes narrowed. “Get to the point, son.” Another step forward, and Cadeyrn’s boots rested against the dais’ bottom step. “I’ve received word that Consta-Mayria is no longer the envoy for Sadeemia. 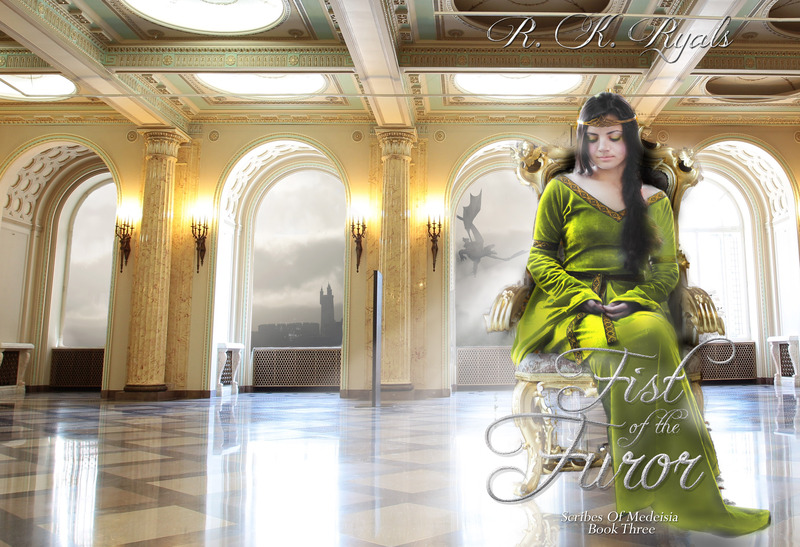 His position has been dissolved and no one has replaced him.” Freemont’s hand came up to the throne’s armrest, his fist tightening around the gilded frame. He knew as well as Cadeyrn what dissolving an ambassadorship meant. Cadeyrn took a step up onto the dais. “Raemon is shutting down relations between our countries. I was raised on our histories, Father. If you wouldn’t believe me before, then believe me now. Something is happening in Medeisia, and Sadeemia is the closest country to its borders. You wear the other half of the dragon pendant. I don’t trust Raemon.” Freemont closed his eyes and sighed, his brows creasing. The king suffered from massive headaches. They had gotten worse as he’d aged, and he felt the sharp twinges of pain in his temple that signaled an oncoming spell. “Do not let your past color your assumptions,” Freemont said carefully. “It could be Raemon has closed down relations with all countries, not just our own.” Cadeyrn was silent. The king didn’t have to open his eyes to see the pain hidden in his son’s gaze. It was always there, just beneath the surface. Cadeyrn had suffered much in his young life. Born with a magic so strong even the mages who attended his birth were afraid of him, the prince had been plagued with hardship. He was viewed with awe by his countrymen, but viewed with fear by his enemies. Cadeyrn was only five turns when the first attempt on his life was made by a foreign assassin from Freesia. It had nearly killed him. Since then, Freemont had taken every possible precaution to ensure his son’s safety. Cadeyrn was trained from childhood to fight with all weapons available to the king. It helped that Cadeyrn’s magic somehow seemed connected to steel. No one had ever bested the prince with a sword. But even that had not eliminated tragedy. So much tragedy. “Mark my words, Father,” Cadeyrn finally insisted, his voice hard. “Raemon is planning something.” The king opened his eyes, his gaze going to his son’s strong face. Cadeyrn may be his second son, but he was the strongest. The differences between the king’s heir and spare were stark. Where Cadeyrn was large, Arien was small. Where Cadeyrn was fierce, Arien was quiet … pensive even. Arien was a thin, awkward man married to a princess from Yorbrook. The birth of their first child, a son, had cemented the relationship between Sadeemia and Yorbrook, ensuring the Bernharts had a direct male heir to the throne. Cadeyrn, on the other hand, was a strong military leader, and his upcoming marriage to a Greemallian princess would make Sadeemia one of the strongest nations in the region. A king could not ask for more. Freemont’s gaze turned critical. “I hope your mother hasn’t seen you since your return.” Cadeyrn’s jaw tensed. “She has not.” Freemont nodded. “Good, good. You know how she feels about loose attire. Make sure you don a coat and restrain your hair before she receives you.” Cadeyrn inclined his head. “I will take my leave then,” the prince said, his voice tight. Cadeyrn turned, his gaze on the hall. He wore a sword at his side, and his hand went instinctively to the hilt. His magic responded immediately to the steel beneath his grip, and he used it to calm himself. He didn’t wait for his father to dismiss him. The prince was halfway down the hall when Freemont called to him. Cadeyrn paused, his gaze straight ahead. The king spoke loudly. “Send your spies, Cadeyrn.” One corner of the prince’s lips quirked. It wasn’t quite a grin, but it was close. Cadeyrn didn’t smile. He wasn’t sure he even remembered how. There is chaos in the kingdom of Medeisia. The rebels have gone into the mountains to hide, protected by the dragons. Their only hope lies in a band of insurgents who made an arduous trek across the Ardus to seek the aid of a king … Plagued by grief, seventeen year-old Drastona Consta-Mayria becomes a leader for her people, the voice of the common folk, the forest, and the dragons. Living now among the royalty of Sadeemia, Drastona and the rebels must navigate something much more complicated than war, politics. Prince Cadeyrn of Sadeemia is a powerful mage, a second son living under the constant threat of assassination. He’s a man existing in the shadow of tragedy. But there is hope in his magic, hope in the way he fights, and hope in what he can do for his country. War has been declared between Sadeemia and Medeisia, a war led by rebels and aided by a king. But can the rebels survive the court of Sadeemia? For in the magnificent marble halls lies betrayal. This is a very good book, it kept me in it till the end… when is it going to continue? Hi, Jayson!! I apologize for how long it took me to reply! I am so excited that you like the series!! 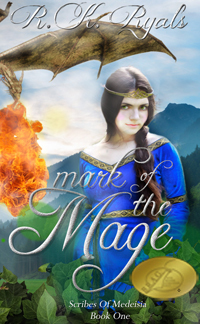 Right now, I have two books out in this series, Mark of the Mage and Tempest. The next book in this series will be releasing this year, in the next 6 months, but no official date yet. So excited that you are interested in it!! Massive hugs! When will A City in Ruins be released??? I have read this entire series so far in the past 5 days and I can not wait for the next book to be available to me!! Please say it will be soon! Hi, Megan! City in Ruins is actually slated to release no later than January 2015, and I am so excited! This series has truly taken my heart by storm, and I can’t thank you enough for sharing this world with me! Massive hugs and tons of love! Hi, Jayson! 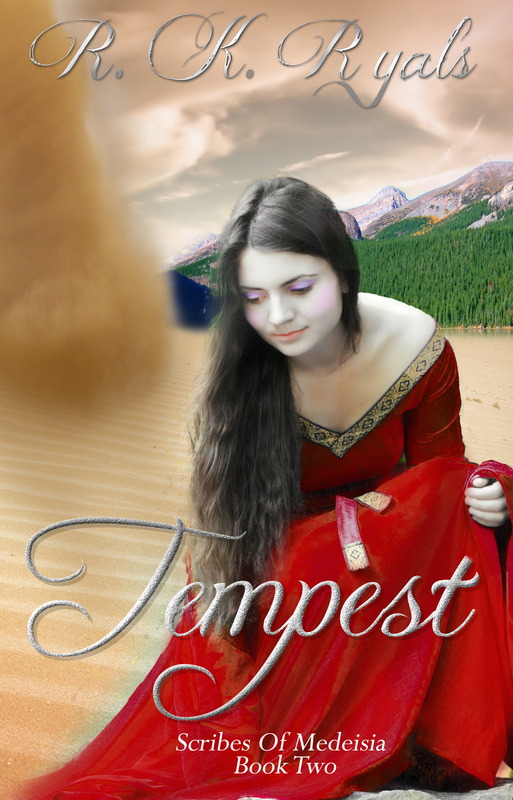 The second book in this series, Tempest, is already available on Amazon and Barnes and Nobles and will hopefully be available on iTunes and other outlets soon! Huge hugs to you! I’m SO happy to hear this! I finished the first one last night and was So sad when I couldn’t find the sequel. Turns out I was just missing it on my nook shop screen. I’m glad I looked up this web site. Thank you for posting! And what a great series. I love it and am so excited to read the Tempest now. I am halfway finished with this book! absolutely in love!!! I can’t wait to get more books! much love! I read both of the books in this series in one day and loved them both. I can’t wait for the next one. I need book 3!!!!!!! Wheeeeen laughing! Yay! I am so excited that you are enjoying the series! This series really means a lot to me! Book 3 will actually be available late next month/early January depending on editing. So not much longer! I am so excited about this release! It means so much that you are reading! Massive hugs! Just finished the 3rd book! Thanks so much for a great story, love it! Now I can’t wait for the 4th! So my question is when will it be published and is it the final book in the series? Hi, Alissa! Thank you so much for reading! The Scribes of Medeisia series means so much to me! The fourth book is scheduled to release the end of this year in the fall. Not sure of the absolute date just yet, but probably around September 2014. This is the planned final book in the Scribes of Medeisia series, but I will be writing more fantasy books based in the world of the nine kingdoms. I have a series coming out in 2015 called The Spices of Guarda series that takes place in Guarda and Yorbrook. I can’t thank you enough for reading! Massive hugs and loads of love! Fantastic story. Great, dimensional characters. Can’t wait for the conclusion!!! Thank you so much for sharing Drastona’s journey with me, VJ! That means so much! City in Ruins (book 4) is the last in the Scribes series, but not the end of the stories that take place in the Nine Kingdoms. Another series I am launching in 2015 called The Spices of Guarda series will also take place in the Nine Kingdoms in Yorkbrook and Guarda. I am so excited about this world! Thank you for sharing it with me! Hugs and love! I absolutely LOVED the series and am anxiously awaiting the next book. Please write quickly. The characters seemed so real I became emotionally attached to them! Is there a way to know when the fourth book of “the scribes of medeisia” will be out? Hi, Lynna! Thank you so much for your interest in my books! I can’t tell you how much that means! Book 4 in the Scribes series, City in Ruins, is set to release in Fall of 2014, although the exact date is unknown. I am so excited about this series. I can’t thank you enough for following Drastona’s journey! Massive hugs and love! It was hard to put the books down. Thank you for this series. City in Ruins will officially release on July 5th. Thank you so much for commenting! The final release dates revealed for the first books to release this year are Revelation-May 31, City in Ruins-July 5th, and a backlist project that will go on preorder in June/July. I’m so excited to finally have dates that are set in stone! Also, this website is no longer in use, so please feel free to find me on Facebook under R.K. Ryals, on my new website at http://www.authorrkryals.com, on instagram as @rkryals or on Twitter as @RKRyals. Thank you so much for following and reading. It truly means the world. Found Mark of the Mage on a list for free reads…am almost done and already plan to buy the next ones as soon as I finish! I can’t wait for the 4th book and I’m still reading the first. It has been a while since I got this caught up in a book this quickly. Wonderful! Thank you so much, Jennifer! I can’t begin to tell you how much that means! Massive hugs and loads of love to you! I have screamed and sobbed over it. So many tears over family love. Different kinds of love. Different kinds of romantic love. Ok… I am absolutely mesmerized by this series! I am almost to in live to finish book 3, without knowing when book 4 us being released!!! Any idea when City in Ruins is coming!?! I cannot wait for City in Ruins! I’m an avid book reader and this series really caught my attention lol I don’t think I put my iPad down in 3 days! I was very heartbroken not being able to find the 4th book. I hope to find it when it comes out soon! Keep up the great work! I just finished book 3 and I’m on the verge of tears I can’t wait for book 4 I don’t think I’ll be able to hold my imagination in check til it comes out I’m already freaking out here from anticipation and its literally only been three minute since I finished the book!!! I finished the first three in two days I just could not put them down! I cannot wait for the forth to come out! I had read all of your series and also wait anxiously for the final in the Thorne trilogy! You’re amazing! I could not put these books down. The last three days have been an intense roller coaster of emotions as I lived through this journey with Stone. When I saw the fourth book was not out I got whiny because I can’t stop now! I am anxiously awaiting the release date for the next one, three books in three days, I need the fourth one now! I cannot wait to read some of your other series, and am also very excited about the other books about the other 9 kingdoms! This means so very much, Lauren! Thank you so much for reading and for sharing this world with me! I’m so excited about City in Ruins and the different places the Nine Kingdoms have taken me! Right now, City in Ruins is slated to release no later than January 2015, and I can’t wait to share it! Massive hugs and tons of love! Can’t wait for Scribes of Medeisia Book 4, have just finished reading book 3. Although I enjoy reading many types of books nothing I’ve read in recent years, has gripped me as this series has, just haven’t been able to stop reading! Omg,downloaded 1st book last week, on finishing bought 2 and3 together, would have bought City in Ruins if it had been there! I absolutely love the series! I’m 54 and never cried reading a book until now! Thank you! Love the characters, I am, and not looking forward to the finale, our Little Birds powers, does Lochlen and the dragons continue to exist, does Cadeyrn also rid himself of the remaining wife! Lol I cant wait! Now I’ve discovered your books I shall be downloading everything! Seriously dying for the final book here. I’ve been checking weekly hoping hoping it will be out soon. I can’t wait for January!!! How about the best Christmas present ever for all your fans 🙂 ?? Oh my gosh! Your enthusiasm means the world! Thank you! My husband was involved in an accident that resulted in a head injury and there were some other family medical emergencies at the beginning of the year, but I finally have final release dates for three books! I am so excited! They are finished and in the editing process now before their releases! Ive just read the 3 books of the Medeisia series. I loved them all. I cannot wait for the 4th one. I hope that it will be out soon! I love these books! Where can I buy the fourth one? Hi again! What day this month is City in Ruins set to be released?? I have been seriously waiting with bated breath for this month to get here so I can finally read the book. This has become one of my favorite series, and I can only count those with one hand. Please say the day is coming up!!! Thank you so much! I can’t begin to tell you how much this means! I am so excited for the fourth book to come out!! I have enjoyed this series so much! Hopefully we will find out the rest of Stone and Caderyn’a journey this month!! I keep checking your website to hear the news about book 4 of the Scribes of Medeisia series. I loved the other three books and can’t wait for the next one. Do you have any news about it? Thanks for offering us a glimpse of your imagination. Loved the stories of Stone and her love for nature, her country and her dragon in the scribe series. Only 4 more days until the end of January, please, please, please tell me city in ruins is available soon? Keep on writing, you inspire and amaze me with your stories! I read the 3 books in the Scribes of Medeisia series I could find, but I can’t find book 4, City in Ruins. I wanna cry. I love the series so much, I laughed so hard and cried really hard to. I NEED the 4th!!! I thought the 4 th book was to b out by jan?? Love all the series! I read them in three days! Can’t wait for book 4. When is it planned on coming out? Thank you so much for such great books!!!! Hi…it is now mid April 2015…still no city in ruins….the danger for a writer who gives release dates then doesn’t follow through is the reader who is waiting will forget about the series and move on to other books..it’s quite disappointing..JV Jones did this..5-6 years between books in a series leaving her readers hanging with empty promises on non existent release dates…….I understand books are imagination at work and take time…but please don’t give release dates that you know won’t be kept….. Thank you for your comment. There were some issues the beginning of the year that delayed releases. My husband was in an accident that resulted in a head injury, and my middle daughter was tested when her health showed some worrying signs. Unfortunately, I had to pause releases because of this. This career is one I would never change, and I’m one of those authors who truly believes that I owe my readers for their loyalty, so I thank you for reading, and I sincerely apologize for the delay. When is book 4 coming out, I can’t wait to read it. City in Ruins will officially release on July 5th. Thank you so much for commenting! The final release dates revealed for the first books to release this year are Revelation-May 31, City in Ruins-July 5th, and a backlist project that will go on preorder in June/July. I’m so excited! Also, this website is no longer in use, so please feel free to find me on Facebook under R.K. Ryals, on my new website at http://www.authorrkryals.com, on instagram as @rkryals or on Twitter as @RKRyals. Thank you so much for following and reading. It truly means the world.